To do this, we need A LOT of help and support. To help you understand more about what we do at OSCAS, we will be following the story of Bruno very closely to give you a sneak peak into how we care for our terminally ill dogs. Bruno gets discharged from the Vet and goes to a fosterer's house. Bruno is a tenacious strong boy who has been fighting for his dear life after suffering from severe pancreatitis. Prognosis is guarded as he has not been able to stand up and consume any food and water. Food and water have to be syringe-fed. Despite such conditions, Bruno showed no signs of pain and still managed to perk up and faintly wags his tail whenever volunteers visited him at vet. Because OSCAS is a no-kill shelter, we do not have the heart to put dogs down simply because their prognosis is poor. 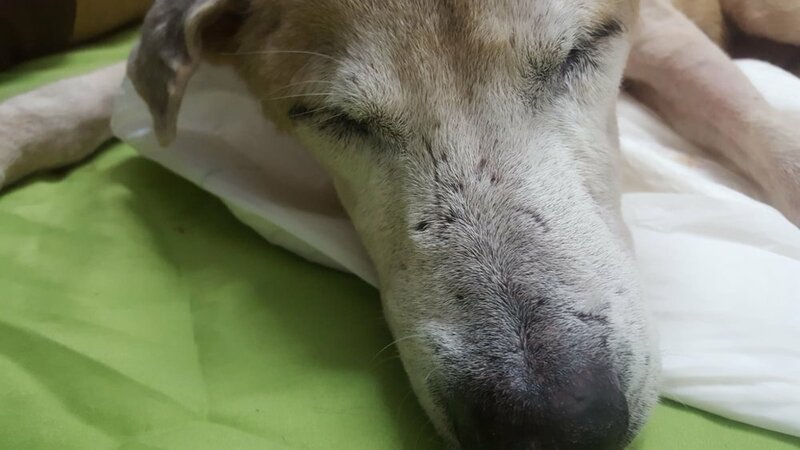 Suddenly, our prayers have been finally answered when Anita Chew, a fosterer, agreed to provide palliative care to Bruno at her own house. And give Bruno a chance to have a dignified ending before he enters Paradise, instead of passing on at the vet or shelter. Bruno looks so much happier at Anita's place! Bruno still cannot walk on his own, nor can he feed or drink by himself. On the bright side, he can and will only eat blended food and drink water with assistance. Moreover, he was so happy (tail wagging!) when we supported him as he walked and explored the house. In the past, during feeding time in the shelter, Bruno always show aggressive tendencies towards the neighbouring dog (Murano). Having a great dislike towards each other, Bruno and Murano will growl and snarl whenever food is placed in front of them. Nevertheless, Bruno is not aggressive to humans and he enjoys taking walks. Furthermore, his strong curiosity always results in him exploring novel surroundings without a tinge of fear. Bruno is still lying down most of the time, with eyes closed. On the bright side, he is still eating and drinking. Bruno suffered from a stroke early this year, nevertheless he managed to recover after obtaining lots of nursing care and love from Roof for Woofs. He is such a strong boy who has managed to overcome all tribulations. His never-give-up attitude never fails to inspire us. Here are two videos of Bruno, taken when Bruno was having a stroke earlier this year. Friends of Bruno, Cheryl and Christal visited him today. They used to walk him back when OSCAS was still at Pasir Ris Farmway. Although Bruno may not have his eyes opened completely to see them, we know he felt and could hear their presence. The girls cleaned him up and ensured he was ready for a good night’s sleep. Bruno remained the same as he was fro the past 3 days - a lovely and easygoing boy, we are all praying hard for his speedy recovery! The house was silent; atmosphere calming; leaves and branches from the outside creating soothing sounds - Bruno was sound asleep. When he heard footsteps of someone visiting, he tilted his neck and was eager to find out who was there - with his eyes closed. Reassured it was someone familiar, he went back to sleep. Lunch was prepared and the lovable boy completed his meal within minutes. Bruno also wanted to be up on his feet - which he did, but was still weak. That was a sign of improvement and we were happy he was moving around more and opening his eyes a tad more too! Bruno is more alert than usual. His eyes are also opening more than usual! Bruno’s legs are slowly gaining strength and hopefully he will be able to walk without assistance for a longer period. Thanks to the fosterer and the volunteers who come down to visit, feed, shower, medicate, message and play with him during this difficult period. Bruno is one strong fighter who has an iron will to live. Hopefully we can bring him down for a walk in the near future! Bruno is getting much better. His limps are not so weak and wobbly and he is becoming more curious and confident! Bruno is a real fighter - he pulls through during the toughest times and never fails to surprise us with his recovery. When he was fostered, he was not able to walk without support, now, he can walk and even eat on his own! We are excited to see Bruno whenever we visit him, he fills our hearts with such joy and happiness. Bruno occupies the second floor of the fosterer’s apartment, which means we have to take a flight of stairs up. As came to the top of the stairs today, we heard a familiar sound, it was the sound of Bruno’s nails clunking with the flooring. He was roaming around in the living room, to the kitchen and to the bedrooms, ALL BY HIMSELF! “Hello Bruno! What are you doing! Look at you!” We ran over to give him a huge hug. Bruno is also eating on his own, he gobbled up his food on his own and even went for round two! Though he may be a senior dog, but his perseverance and determination to live is truly remarkable. We are so lucky to have the honour of witnessing such a miracle, and we hope those who chance upon this will be encouraged some way or another to press on during tough times. He was not in the living room where we left him. We walked further. There he was, soundly sleeping in the kitchen. His eyes slowly opened as we approached him. It was such a lovely sight. We accompanied him back to the living room where he decided to lay down for the rest of the afternoon. Next on our to-do list: to bring him down for walks where he can feel the grass, the pavement and enjoy the fresh air and scenery!